How can a round of golf help veterans with post-traumatic stress disorder? Start with a group of committed law students who are driven to serve those who have served our country. 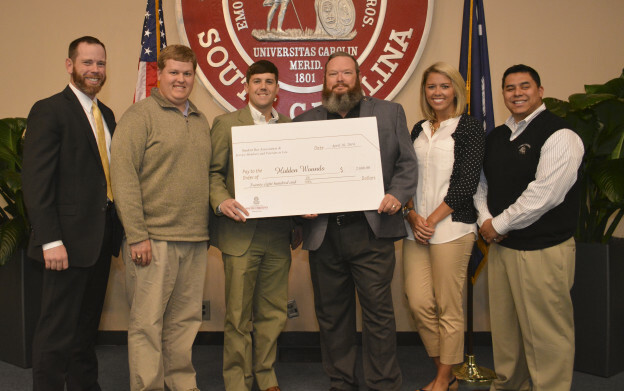 For the third straight year, two University of South Carolina School of Law student-led organizations, Service Members and Veterans in Law (SVL) and the Student Bar Association (SBA), joined forces to host a charity golf tournament with the goal of raising money and awareness for the Columbia, S.C.-based non-profit, Hidden Wounds. Hidden Wounds’ mission is to provide peace of mind and comfort for military personnel suffering combat stress injuries such as post-traumatic stress disorder (PTSD), traumatic brain injury (TBI), and other psychological post-war challenges by providing interim and emergency psychological treatment for veterans, military personnel, and their families. In 2014, the tournament more than doubled the amount of money raised in previous years, donating $2800, which will provide much-needed counseling services to area-veterans suffering from combat-related stress injuries. Wall hopes for better results in 2015. “This year, a lot of individuals were instrumental to the tournament’s success, but [rising 3L] Anthony Kim was the main driving force behind it, for which he deserves a lot of credit. I’m looking forward to working with him again to make next year’s tournament even bigger,” he said. The annual event is just one of the ways that SVL helps South Carolina veterans. In 2013, the group brought the national initiative “Project Salute” to the state for the first time, and worked with local attorneys to help veterans file or appeal their benefits claims. Additionally, SVL members help other military-turned-law-students make the transition into law school, and work to create networking opportunities with veterans in the legal community, such as career advice and resume workshops. Pictured above left to right: Members of SVL Michael Bradbury (2015), Ryan Templeton (2014) and John Wall (2015) present a check to Hidden Wounds board members Freddie Brock, US Army (Ret.) and Steven Diaz, USMC (Ret.). Also pictured is Ashley Canara, a senior public relations student at USC and a volunteer with Hidden Wounds. This entry was posted in One Minute Brief on 26 May 2014 by Rob Schaller.